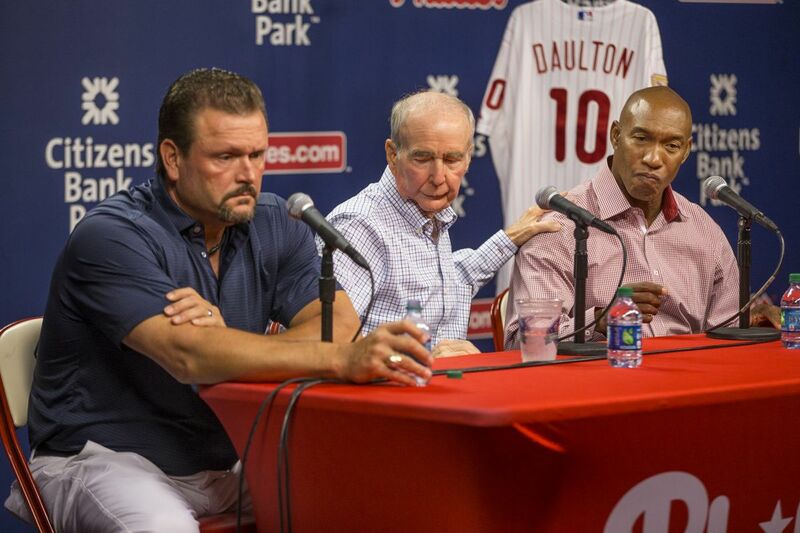 Tommy Greene (left), Phillies chairman David Montgomery (center) and former Phillie Milt Thompson meet the media to discuss the passing of Darren Daulton. Tommy Greene did not know where his life would lead in 2010 after his wife, Lorie, succumbed to cancer. The former Phillies pitcher said he was in a dark place. And then Darren Daulton stepped in. "He saved my life," Greene said Monday afternoon as he remembered Daulton, 55, who died Sunday after a four-year battle with brain cancer. Daulton, who bonded with Greene during that wild 1993 season that resulted in a World Series berth, ran into Wendy Darling shortly after Greene's wife died. Greene and Darling had met in 1986 during Greene's first spring training. Daulton and Darling's conversation soon turned to Greene. FILE / Phillies instructor Darren Daulton speaking to other coaches during spring training practice in Clearwater, Fla., February 22, 2004. "He gave her my number and said, 'Hey, text Tommy and tell him I told you to,' " Greene said. "We don't give out numbers, and he gave out mine. Changed my life. It helped save my life." Greene and Darling married three years later on the beach in Avalon, N.J.
"My life couldn't be any better right now. Happier than I've ever been. He was the one that changed it," Greene said. "That's the way that he really saved me. I didn't know where my life was going at the time. I didn't know what I was going to be doing. There was nothing there for me. That changed my life. Just that one act. He saw something." Before he was a matchmaker, Daulton was the unquestioned leader of the 1993 Phillies. Milt Thompson said Daulton was "the glue that kept a bunch of misfits together." Larry Andersen said Daulton never turned his back on anyone. Larry Bowa said he was the 1993 team's "heart and soul." Bill Giles said the Phillies would not have reached the 1993 World Series without Daulton's leadership. Kevin Stocker, who reached the majors in 1993 and found his locker next to Daulton's, said Daulton never treated him like a rookie and "was the epitome of what an MLB veteran was supposed to be." "Darren wasn't a born leader. He was anointed to be the leader by Lee Thomas and Jim Fregosi," said David Montgomery, the Phillies chairman, referring to the team's general manager and manager, respectively, at the time. "What I mean by not being a born leader is that he was just a high school kid from Kansas trying to make it in the big leagues. He assumed and took the challenge of being told, 'That's your clubhouse.' That's an amazing thing when you think about it. Jim and Lee could identify the type of person he was and how he would respond to it and then the type of leadership that he provided." Daulton challenged Greene and Curt Schilling in July 1993 after three losses in St. Louis that cut the division lead to 5 1/2 games. Daulton said he didn't know whether the pitchers were "tired, nervous, scared, worried, feeling the pressure, whatever. I just know this isn't the time for it." "We both sucked, and he pretty much called us out," Greene said. "It wasn't for a lack of trying. My arm was hanging. But he challenged us to be better. He expected more. It lit a fire because of the way he did it by going through the press. He didn't do that often. But that lit a fire and changed it around a little and helped with the mental side." Daulton's leadership often carried from the field and into the trainer's room, where a large group of players spent hours dissecting each game. Daulton often held those sessions until 3 a.m., and it was Greene's job to bring the leader his "cold refreshment." "I learned more about the game of baseball and how to play the game of baseball from that man during those times in that training room and also on the field," Greene said. "Those were the happy times. There were a lot of good times where you wanted to be around the ballpark and around him. He was infectious with the way he treated people and the way he went about his business. He taught me how to be a professional and how to play the game right. He held me accountable. You can't ask for anything more than that." Greene said he and his wife visited Daulton in March after spending some time at spring training. It was the last time he saw his friend, and he wanted to thank him for what he did. "We expressed how much we loved each other," Greene said. "I expressed how much he meant to me and what he had done in my life. We had sort of a mutual respect in that aspect. I gave him a hug and a kiss. It's one of the toughest things I've had to do."